The Caterpillar museum is part of the Caterpillar Visitor’s Center. Located along the Peoria, Illinois Riverfront this cool museum opened on October 20, 2012. My husband and I have been planning to see this museum for quite some time this past week was the perfect time to come and see what the fuss was all about. The museum is filled with huge machinery that you and yours can sit on and try on for size. 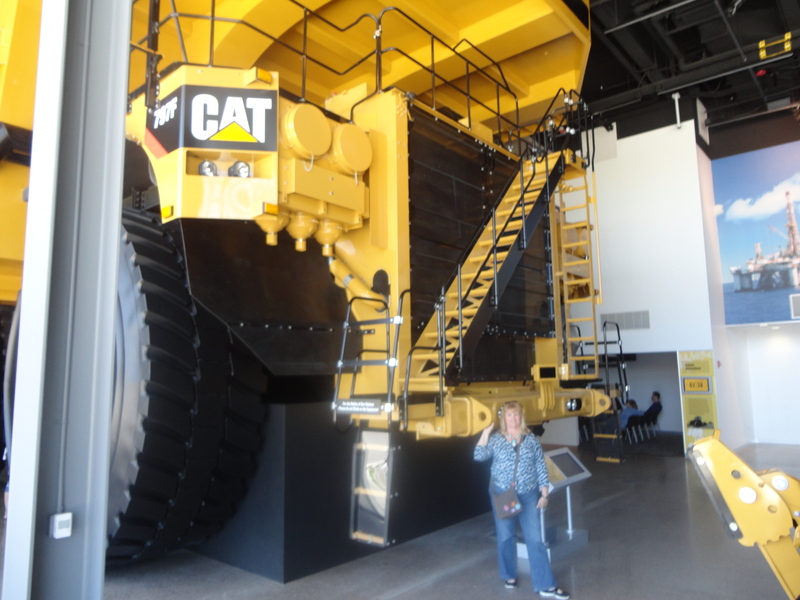 In the picture, I am standing next to the bed of a two-story CAT 797 Global mining truck. This impressive machine is where you start your visit at the center and watch a 10 minute or so video that gives a bit of perspective. CAT employees serve as guides at the museum and offer up their experiences along with assisting with questions. For me, the historical aspect is the most fascinating aspect of the company. I had fun delving into the history of the founders of Caterpillar, Benjamin Holt who started the Holt Manufacturing Company and Daniel Best who created the C.L. Best Tractor Co. for an upcoming story in Heritage Iron where I write about mansions and museums related to agriculture. Both Holt and Best were industry leaders that had founded companies that were creating track style farm tractors. Come and see the museum for yourself, plan a couple hours and a stop at Sully’s Irish pub for lunch! There is a fee of $7 with discounts for seniors, military and children 12 and under are free. There is also a group rate. The Caterpillar Visitors Center is open 10 a.m. to 5 p.m. Monday through Saturday with last ticket sale and entry at 3:30 p.m. Most guests spend 1 ½ – 2 hours during their visit. The Visitors Center is closed on Sundays and holidays. The Caterpillar Visitors Center is located at 110 SW Washington Street in downtown Peoria, Illinois, near the Caterpillar world headquarters at the corner of Main Street and Washington Street. Log onto http://www.caterpillar.com/visitors-center/plan-your-visit for more information! Previous Post: Sully’s Pub in Peoria is a fun place to dine! This is a great place for kids. If you son liked the Pavilion, he would enjoy climbing on the CAT machines as well. The company history fascinated me as well.